This entry was posted in Stories and tagged #BattleoftheBands, Battle of the Bands, BOTB, Do You Know What I Mean, Genya Ravan, Gwen McRae, Lee Michaels, music by greyzoned/angelsbark. Bookmark the permalink. I guess you could say that Gwen & George McRae were a “rockin'” couple given their solo hits “Rockin’ Chair” and “Rock Your Baby.” Gwen’s “Funky Sensation” is coming up on SPMM in an episode of Shady Train. In your battle, I enjoyed female cover #1, the version of “Do You Know What I Mean” by Gwen McRae The recording really starts cookin’ during the break. At the 4:30 mark I detected a sampling of the riff from Michael Jackson’s “Wanna Be Startin’ Somethin’.” I can imagine Gwen’s platter being played in clubs. I was a bachelor and a lounge lizard in 1984, but I don’t remember hearing it in the clubs I frequented. I am familiar with Goldie and The Gingerbreads because I also have them scheduled in an upcoming post. I think Genya Ravan should have stuck with her birth name Genyusha Zelkovicz as her stage name. After all, Arnold Dorsey changed his name to Engelbert Humperdinck and achieved worldwide success. Perhaps Genyusha Zelkovicz could have become a household name as well. 🙂 In your band battle, I prefer Genya’s version of “Do You Know What I Mean” because it is a rock song and works better with a rock arrangement and rock sensibilities. The organ and guitar are high in the mix and pack a punch. Genya’s recording reminds me of Rod Stewart’s “Hot Legs.” Can you hear the similarity in the riff? At 1:45 the guitar does that sting thing from Led Zeppelin’s “Whole Lotta Love.” Do you hear it? Genya’s version simply has too much going for it not to receive my vote. I vote for Genya Ravan! I kept my house dark too and blocked off my porch as a further measure. I looked out a few times and saw some trick or treaters, but not as many as in the past. It all looked kind of sad and I almost regretted not handing out candy. Really though, the folks I saw didn’t look all that little. Halloween just isn’t what it used to be. I’ve never seen any of the “Halloween” movies to my recollection. I actually have the first film on DVD still wrapped in cellophane and unwatched. Maybe I’ll get to it someday. I’m not particularly enthusiastic about seeing any of these films though. Gwen’s version was okay. A bit discoey, but okay. I’ve liked Genya’s style ever since I first heard “Through the Eye of the Needle” by Ten Wheel Drive. Come to think of it, that might be the only song by her that I’ve ever heard, but it’s stuck with me since I first heard it in 1969 or thereabouts. My vote goes to Genya Ravan. Both versions are all right, tho not as good as the original. Genya’s voice seems to get swamped by the backing band and vocalists. Gwen’s is good but goes on and on and on, and I didn’t find the first minute (which you said we could skip, but I didn’t) added anything to the overall song. But I liked it better, so Gwen gets my vote. I wasn’t sure what to expect for Halloween this year, as I haven’t lived in the area for 20 years. Being in an apartment with indoor hallway, It’s not as though I could turn off the porch light and pretend I wasnt home, as I had in my place in Portland… and there are children that live below me. So I invested in some goodies. Sorted them by the good stuff and the really good stuff, with plans to give out the good stuff first and the really good stuff last. Turns out I didn’t have visitors at all. I think everyone went to the local Trunk or Treats instead. I spent my evening working on blog stuff and watching old episodes of House. For your battle, I’m going to go with Genya. I just liked her style a little more. Halloween was nearly a non-event at our house, as we got a grand total of 10 “trick-or-treaters” that we honored with the traditional treats…candy is dandy. Most of our neighbors are up in years and we just don’t have a big bunch of kiddos hanging around. As for the battle, I swear to you I was just singing this song the other day! What are the odds? I gotta give it to Genya, though neither version can touch the original! Lots of research / background info here that I was not aware of. 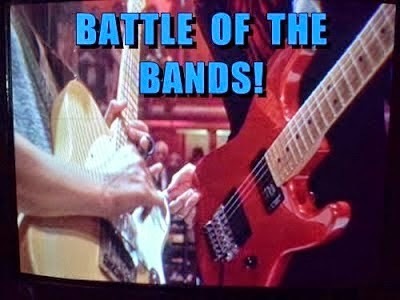 Sometimes BOTB is as much music history as it is a contest. As a couple other boters have stated, the Gwen McRae version is closer to Disco than it is to Rock. And the tone was set with the original recording of this song as a punchy rocker. So, I think Genya Ravan is stylistically in tune with what we’ve come to expect when it comes to this song, and she gets my vote, too. It’s early in the boting yet, but it already appears that Genya is likely to advance to the Championship round. And I’ll go out on a limb here, though, and add that I think Genya is going to have her hands full against Kevin Naquin & his Ossun Playboys. I heard the Lee Michaels original played just last night in the grocery store next door to where I live and it immediately made me think of your last Battle. I’ve never seen any of the ‘Halloween’ movies. Horror is not my genre and there are only a small handful of them that I like. A mostly forgotten one that I always recommend to people is ‘THE SENTINEL’ from the mid-1970s which includes Burgess Meredith in the cast. It’s pretty darn creepy. (I don’t think the trailer does it any justice.) It’s not a slasher kind of Horror movie; more of a mind-ph*q kind of thing. The “horror” is in the weirdness and that “what the hell is going on here?” mystery that the movie is built upon. My vote goes to Genya who gave a more rock style. I was not at all into Gwen and felt it just went on too long even though I started it at the one minute mark. I could not watch the original Halloween movie until just last year as I find scary movies too scary and later, too gory. I always liked Donald Pleasance and he was in so many of them. I wish the guy would finally die but I have a feeling he still isn’t dead. I love Halloween and loved trick o treating and didn’t stop until I was 17. I did go out once when I was 23 with 2 friends but went out At 8 and in an area where no little kids were. We were all ghosts to hide our faces and the guy had to wear gloves due to his hairy fingers. When I moved into my home here, we had 120 and it went up to 160 kids but it slowly dwindled. This time we only had 15! I think it is a combo of being midweek, lousy weather and all the kids have grown up. I’m sorry for cutting this so close. It’s been a wild ride for the past several days. Anywho, I’ll cut to the chase to give you my vote because I have other battles to tend to. My pick is Genya Ravan! Great job!